IL-10 is an immunoregulatory cytokine that has broad effects across the immune system. In Th cell subsets, Th2 cells produce considerable amounts of IL-10. The transcription factors that regulate IL-10 production in Th2 cells are still incompletely described. In this study, we demonstrate that the ETS family transcription factor ETS variant (Etv)5 regulates IL-10 production in Th2 cells. T cell–specific Etv5-deficient and littermate control mice demonstrated that IL-10 production and gene expression were significantly decreased in the absence of Etv5. In an Aspergillus fumigatus extract–induced inflammation model, IL-10–producing CD4+ T cells in bronchoalveolar lavage and lung were significantly decreased in mice that lacked Etv5 in T cells, compared with control mice. We showed that Etv5 directly binds to the Il10 locus conserved noncoding sequence 3 site and that it activates gene expression in a luciferase reporter assay and following retroviral transduction. 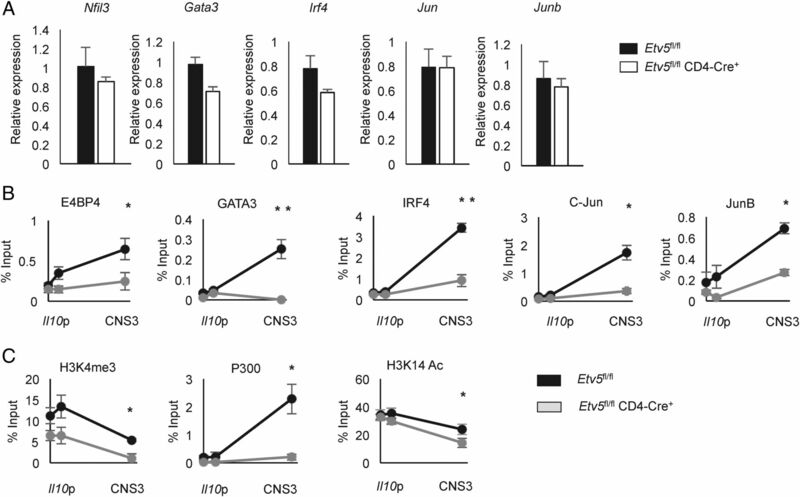 Etv5 deficiency did not affect the expression of other transcription factors known to be important for expression of IL-10, including Jun family members, GATA3, E4BP4, and IFN regulatory factor 4. However, in the absence of Etv5, binding of these transcription factors to the Il10 locus was dramatically reduced. Ectopic Etv5 expression in Th2 cells that lack Etv5 restored IL-10 production and the binding of IL-10–inducing transcription factors including E4BP4, IFN regulatory factor 4, and GATA3. Taken together, we conclude that Etv5 plays a crucial role in regulating IL-10 production in Th2 cells by facilitating the binding of IL-10–inducing transcription factors at the Il10 locus. Effective adaptive immune responses require CD4+ T cells (1). Naive CD4+ T cells differentiate into Th effector cells with the help of APCs to regulate host defense and inflammatory responses (2). APCs provide three signals inducing lineage-specific transcription factors that are required for proper differentiation of naive CD4+ T cells: the first is a TCR signal initiated by Ag peptide–MHC complexes on APCs; the second, a costimulatory signal through CD28; and the third signal is provided by cytokines that activate the STAT signaling pathway (2). CD4+ Th cell subsets express transcription factors and have specific effector functions mediated by specific cytokines. Th2 cells express GATA3 and produce IL-4, IL-5, and IL-13 that stimulate other immune cells and tissue structural cells (3, 4). Th2 cells also express IL-10 (5). IL-10, an anti-inflammatory cytokine, suppresses inflammatory responses at mucosal surfaces (6). IL-10 was initially identified as a Th2 cell–specific cytokine, but subsequent reports showed that most Th subsets can produce IL-10 (7). IL-10 prevents inflammatory and autoimmune pathologies, but increased IL-10 production prevents clearance of pathogens, resulting in chronic infection. Therefore, IL-10 production needs to be strictly regulated. In Th2 cells, IL-10 expression is induced by IL-4/STAT6 signaling, and GATA3 is required for active chromatin in the Il10 locus (5). Several other transcription factors promote Il10 expression in Th2 cells, including E4BP4 (NF-IL3), IFN regulatory factor (IRF)4, and Jun family members (8–10). ETS variant (Etv)5 belongs to the ETS transcription factor family. Similar to other ETS proteins, Etv5 recognizes and binds GGAA/T, the ETS-specific consensus sequence, through the ETS domain (11). Many studies have shown that Etv5 is involved in cell development (12–14), but the roles of Etv5 in the immune system are still not fully understood. Initial reports suggested that Etv5 expression is increased by IL-12/STAT4 signaling, not by IFN-γ–STAT1 signaling, during Th1 cell development (15). However, we reported that in experiments with Etv5-conditional mutant mice there was no defect in Th1 cytokine production, but a distinct decrease in STAT3-dependent IL-17 production (16). We further reported that Etv5 promotes IL-9 production in Th9 cells (17). Increased Etv5 expression was observed in IL-10–secreting Th1 cells, although no function was tested (18). In this study, we showed that Etv5 increases IL-10 production in vitro and in vivo by binding the Il10 locus and recruiting IL-10–inducing transcription factors. Etv5fl/fl CD4-Cre+ mice (13, 16) were previously described, and Cre− littermates were used as control mice. Mice were maintained under specific pathogen-free conditions. All experiments were performed with the approval of the Indiana University Institutional Animal Care and Use Committee. Naive CD4+CD62L+ T cells were positively selected from the enriched CD4+ T cells from spleen and lymph nodes using MACS beads and columns (Miltenyi Biotec). Naive CD4+CD62L+ T cells were activated with plate-bound anti-CD3 (2 μg/ml 145-2C11; Bio X Cell) and soluble anti-CD28 (2 μg/ml; BD Pharmingen) to generate Th0 or with additional cytokines (all from PeproTech) and Abs (Bio X Cell) to generate Th2 (20 ng/ml IL-4 and 10 μg/ml anti–IFN-γ; XMG) and Th1 (20 ng/ml IL-12, 10 U of human IL-2, and 10 μg/ml anti–IL-4; 11B11) culture conditions. Cells were expanded after 3 d with the same concentration of the original cytokines in fresh medium and in the absence of anti-CD3. Cells were harvested on day 5 for analysis. Mice were challenged intranasally with A. fumigatus extract (Greer Laboratories) every other day for 21 d. Powdered A. fumigatus extract (100 μg) was diluted with 50 μl of PBS and administered intranasally. Mice were sacrificed 1 d after the final intranasal challenge. Bronchoalvelor lavage (BAL) cells were collected with 1 ml of PBS. BAL cells and the single-cell suspension from lungs were stimulated with PMA and ionomycin for 6 h to assess cytokine analysis using intracellular staining. Cytokine production of BAL cells was measured by ELISA. Quantitative RT-PCR (qRT-PCR) and ELISA were performed as previously described (19). Gene expression was normalized to housekeeping gene expression (β2-microglobulin). The relative gene expression was calculated by the change-in-threshold (−ΔΔCT) method. For cytokine staining, CD4+ T cells were stimulated with PMA and ionomycin for 2 h followed by monensin for a total of 6 h, fixed, permeabilized with 0.2% saponin, and stained for IFN-γ (PerCP-Cy5.5), IL-4 (Alexa Fluor 647), and IL-10 (FITC or PE) (BD Pharmingen). Flow cytometric analysis was performed on cells gated for lymphocyte size and granularity and on CD4 expression. A chromatin immunoprecipitation (ChIP) assay was performed as described (20). In brief, activated Th cells were cross-linked for 10 min with 1% formaldehyde and lysed by sonication. After preclearing with salmon sperm DNA, BSA, and protein agarose bead slurry (50%), cell extracts were incubated with rabbit polyclonal Etv5 (H-100), p300 (N-15), E4BP4 (V-19 or C-18), IRF4 (M-17) (all from Santa Cruz Biotechnology), GATA3 (D13C9) (Cell Signaling Technology), H3K14ac, H3K4me3, or normal rabbit IgG (all from Millipore) overnight at 4°C. The immunocomplexes were precipitated with protein agarose beads at 4°C for 1 h, washed, and eluted, and cross-links were reversed at 65°C overnight. DNA was purified, resuspended in H2O, and analyzed by qRT-PCR. The percentage input was calculated by subtracting the amount of immunoprecipitated DNA from the IgG control from the amount of immunoprecipated DNA from the specific Ab and normalized against the amount of input DNA. ChIP primers were used as described (21). HEK 293T cells were grown in DMEM 1640 with 10% FBS and cotransfected with 1 μg of the Il10 promoter, conserved noncoding sequence (CNS)3, or mutated CNS3 luciferase reporter vectors, and control or Etv5-expressing vector, using Lipofectamine 2000 (Life Technologies). After 24 h, cell extracts were obtained through passive lysis buffer, and luciferase activities were measured using the Dual-Luciferase reporter assay system (Promega) according to the manufacturer’s instructions. The Etv5 binding site in the CNS3 region was mutated (from “a” to “t”; −6282, −6283, −6289, −6290) using a QuickChange II site-directed mutagenesis kit (Agilent Technologies). Retroviral transduction was performed as described (16). In brief, activated CD4+ T cells were infected on day 1 with retrovirus containing control or expressing interest gene by using centrifugation at 2300 × rpm at 32°C for 90 min in the presence of 8 μg/ml Polybrene (Sigma-Aldrich). After spin infection, viral supernatant was replaced with the new Th1 or Th2 conditioned media. Cells were expanded on day 3 and analyzed on day 5. Transduction efficiency was generally >80%. Transduced cells were gated on enhanced GFP+ and human CD4+ populations for analysis of cytokine staining. A two-tailed Student t test was used to generate p values for all pairwise comparisons. A p value ≤0.05 was considered statistically significant. Our previous studies have demonstrated that Etv5 promotes the production of IL-17A, IL-17F, and IL-21 in Th17 cells, whereas it had a modest repressive effect on Th2 cytokines (16). Interestingly, a recent study showed that Etv5 is highly expressed in IL-10–producing Th1 cells (18). To determine whether Etv5 had a role in regulating IL-10 production, we isolated naive CD4+ T cells from Etv5fl/fl CD4-Cre mice and Cre− littermate controls and cultured them under Th1 and Th2 cell polarizing conditions before measuring IFN-γ, IL-4, and IL-10 production using intracellular cytokine staining. Although total IFN-γ–producing Th1 cells or IL-4–producing Th2 cell populations were either unaffected or modestly affected by Etv5 deficiency, we observed a significant decrease of IL-10–producing Th1 and Th2 cells in the absence of Etv5 (Fig. 1A, 1B). Consistent with these results, Il10 gene expression and secreted IL-10 concentrations were significantly decreased in Etv5-deficient Th1 and Th2 cells (Fig. 1C, 1D). To further test the function of Etv5, we introduced Etv5 into Th1 and Th2 cells using retroviral transduction. Ectopic expression of Etv5 strongly enhanced IL-10 production in both Th1 and Th2 cells (Fig. 1E). However, the total numbers of Th1 or Th2 cells were not affected (data not shown). Taken together, these data suggested that Etv5 positively regulates IL-10 production in both Th1 and Th2 cells without affecting lineage-specific cytokine production. The slight decrease or similarity in IL-4 production between wild-type and Etv5-deficient Th2 cells (Fig. 1B, 1D) was surprising because our previous study demonstrated increased IL-4 in the absence of Etv5 (16). We found that the difference in the result is due to changes in the Th2 cell culture condition (Supplemental Fig. 1). Thus, increased costimulation and IL-4 signaling alter the effects of Etv5 deficiency on IL-4, but not on IL-10. Etv5 promotes IL-10 but does not affect IL-4 and IFN-γ production. (A–D) Naive CD4+ T cells from control and Etv5fl/fl CD4 Cre+ mice were cultured under Th1 or Th2 cell conditions for 5 d. (A) On day 5, Th1 and Th2 cells were stimulated with PMA/ionomycin for 6 h to measure cytokine production using intracellular staining. (B) Average percentage of IL-10–producing Th1 and Th2 cells. (C and D) Th1 and Th2 cells were restimulated with anti-CD3 for 6 h or overnight to measure Il10 gene expression by using qRT-PCR (C) or to assess cytokine production by means of ELISA (D). (E) Naive CD4+ T cells from wild-type mice were differentiated under Th1 and Th2 cell conditions. Twenty-four hours after initiation of culture, cells were transduced with control or Etv5-expressing retrovirus. On day 5, cells were stimulated with PMA/ionomycin for 6 h to measure cytokine production using intracellular staining. (F) Average percentage of IL-10–producing Th1 and Th2 cells after retroviral transduction. Data are means ± SEM of four independent experiments (n = 4 per experiment). *p < 0.05, **p < 0.005, ***p < 0.001. A. fumigatus–challenged Il10−/− mice showed exaggerated airway inflammation with significant increased production of Th2 cytokines (22). To define the effect of Etv5 on Th2 cells in vivo, we sensitized mice with A. fumigatus extract every other day for 21 d to induce type 2 inflammation (Fig. 2A). One day following the final challenge, we collected and counted BAL and lung cells. There was no difference in numbers of total cells in the BAL, eosinophils in the BAL, or total cells in the lung between control mice and mice that had Etv5-deficient T cells (Fig. 2B–D). However, using intracellular cytokine staining, the IL-10–producing CD4 T cell population was significantly decreased in mice that had Etv5-deficient T cells in both BAL and lung, compared with control mice (Fig. 2E, 2F). This result was consistent with decreased IL-10 present in the BAL fluid in mice with Etv5-deficient T cells (Fig. 2G). However, Etv5 deficiency did not affect production of IL-4 in vivo (Fig. 2E, 2F). These data demonstrated that Etv5 plays a crucial role in regulating IL-10 production in vivo. Etv5-deficient Th2 cells produce less IL-10 in Aspergillus fumigatus extract–induced airway inflammation. (A) Control and Etv5fl/fl CD4 Cre+ mice were intranasally challenged with A. fumigatus extract every other day for 21 d. (B–D) Total cell count (B) and eosinophils (C) in the BAL, and total cell count in the lung (D) of A. fumigatus extract–challenged control and Etv5fl/fl CD4 Cre+ mice. (E and F) Lung and BAL cells were stimulated with PMA/ionomycin for 6 h to measure cytokine production using intracellular staining. Representative dot plots (E) and average percentage of IL-10–producing Th2 cells in BAL and lung (F) are indicated. Cells for flow cytometric analysis were gated on lymphocyte size and granularity, as well as expression of CD4 and TCRβ. (G) IL-10 production of BAL cells was measured using ELISA. Data are means ± SEM of two independent experiments (n = 6 per experiment). *p < 0.05, **p < 0.005. The Il10 gene locus consists of a promoter and several CNS regions (7). Previous studies reported that several IL-10–inducing transcription factors bind to the Il10 locus and promote Il10 expression (5, 8–10). Specifically, CNS3 is a primary target region of IL-10–inducing transcription factors and critical for IL-10 regulation (10) (Fig. 3A). To test the ability of Etv5 to directly activate gene expression from Il10 regulatory elements, we cotransfected HEK 293T cells with Etv5-expressing vectors and reporter vectors containing the Il10 promoter or CNS3 region. Etv5 significantly increased CNS3 reporter activity but did not activate the Il10 promoter reporter (Fig. 3B). To define the Etv5 binding element, we mutated an ETS binding site in the CNS3 region from 5′-GGAAGTGGGAA-3′ to 5′-GGTTGTGGGTT-3′. The mutation of the Etv5 binding site in the CNS3 region eliminated the ability of Etv5 to transactivate the promoter (Fig. 3B). We then tested whether Etv5 directly binds to the Il10 locus at the promoter and CNS3 region using a ChIP assay. Etv5 strongly bound to CNS3 regions in Th2 cells but not in Th0 cells that have minimal expression of IL-10 (Fig. 3C, data not shown). As a control, Etv5 does not bind to several regulatory elements in the Il4 locus, consistent with a lack of altered IL-4 production in Etv5-deficient Th2 cells (Fig. 3C). These data suggest that Etv5 directly binds to the Il10 CNS3 region and promotes gene expression from binding this element. Etv5 binds the Il10 locus in Th2 cells. (A) Schematic of Il10 locus. (B) Luciferase activity of HEK 293T cells transfected with Etv5-expressing vector or control vector with Il10 locus reporter vectors. (C) ChIP analysis of Etv5 binding on Il10 and Il4 locus in Th2 or Th0 cells. Data are means ± SEM of two independent experiments (n = 4 per experiment). *p < 0.05. HS, hypersensitivity site. Although the reporter assay would suggest that Etv5 can directly activate the Il10 gene, it is also possible that Etv5 regulates the expression of other transcription factors that are required for IL-10 expression. To determine whether Etv5 regulates expression of those transcription factors, we measured gene expression of the transcription factors in control or Etv5-deficient Th2 cells. Expression of Nfil3, a global IL-10 regulator that encodes E4BP4, was not affected by Etv5 deficiency (Fig. 4A). Similarly, gene expression of other transcription factors was not affected by Etv5 deficiency (Fig. 4A). Etv5 enhances the binding of IL-10–inducing transcription factors. (A) Expression of IL-10–inducing transcription factors in control and Etv5fl/fl CD4 Cre+ Th2 cells were measured using qRT-PCR. Th2 cells were restimulated with anti-CD3 for 6 h followed by cDNA synthesis. (B and C) ChIP analysis of IL-10–inducing transcription factors (B) or histone modifications and p300 (C) at the Il10 locus in wild-type or Etv5-deficient Th2 cells. Data are means ± SEM of two independent experiments (n = 4 per experiment). *p < 0.05, **p < 0.005. Despite normal expression of other IL-10–inducing transcription factors, it was still possible that they were not able to bind Il10 in the absence of Etv5. To test whether factors that bound the Il10 locus were still binding the Il10 locus in the absence of Etv5, we used ChIP assays to assess binding in control and Etv5-deficient Th2 cells. In the CNS3 region, recruitment of all transcription factors was significantly decreased in Etv5-deficient Th2 cells (Fig. 4B). Etv5-deficient Th2 cells also showed decreased histone 3 lysine 4 trimethylation, an active promoter marker (Fig. 4C). P300, a histone acetyltransferase, strongly bound to the CNS3 region, but binding was greatly decreased in Etv5-deficient Th2 cells (Fig. 4C). Histone 3 lysine 14 acetylation, linked to p300 activity, was also significantly decreased in Etv5-deficient Th2 cells (Fig. 4C). 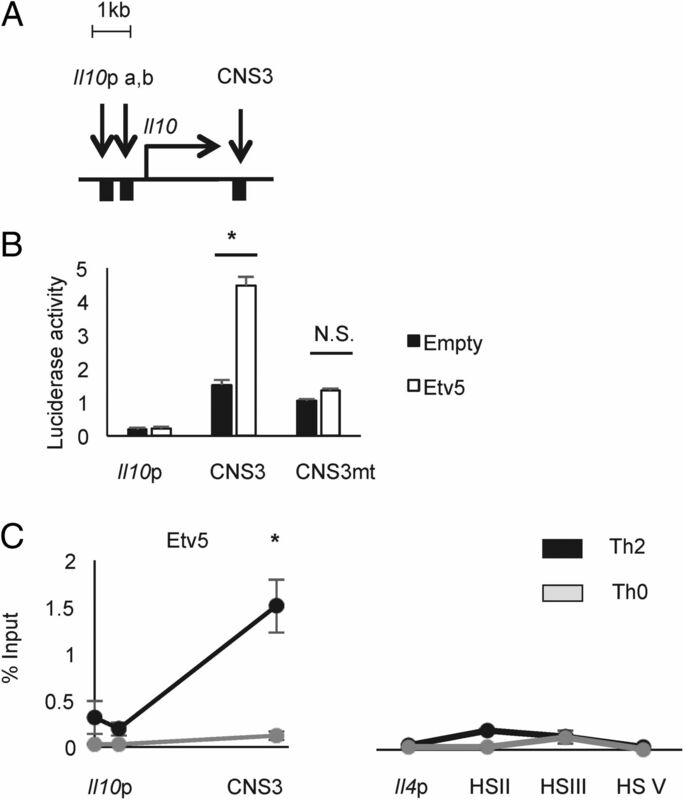 Thus, Etv5 is required for the maximal binding of IL-10–inducing transcription factors to the CNS3 region in Th2 cells. 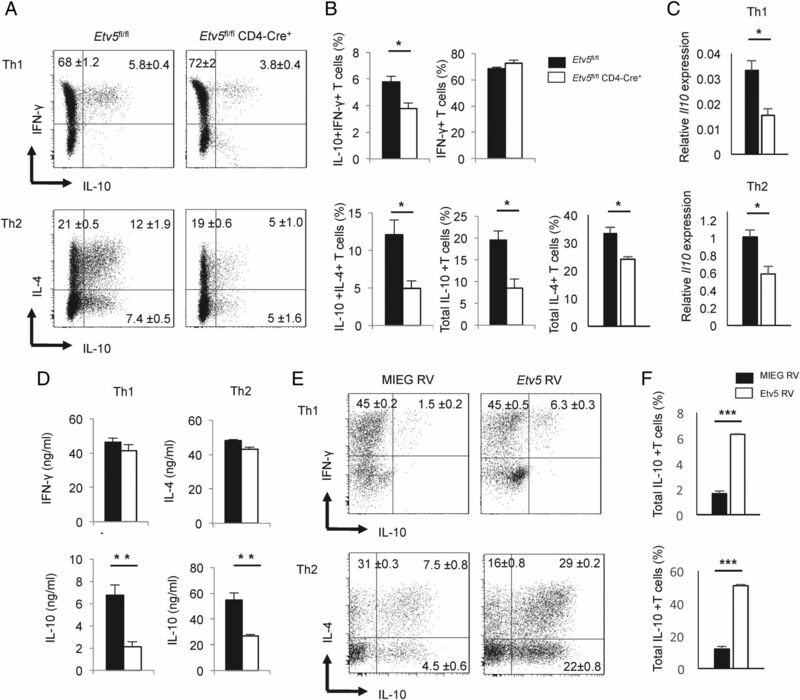 The diminished binding of multiple transcription factors to the Il10 locus suggests that transduction of those factors into Etv5-deficient T cells would also have diminished effects. To test this directly, we ectopically introduced Etv5, E4BP4, or GATA3 into control or Etv5-deficient Th2 cells using retroviral transduction and measured IL-10 production using intracellular staining. In control Th2 cells, ectopic expression of each factor significantly promoted IL-10 production (Fig. 5). In Etv5-deficient Th2 cells, ectopic Etv5 expression rescued IL-10 production to control levels (Fig. 5). 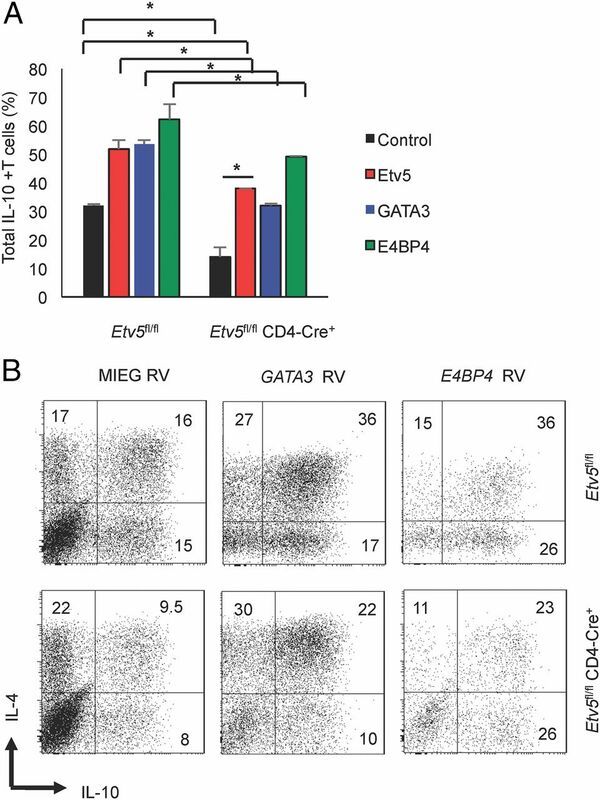 Ectopic expression of GATA3 and E4BP4 increased IL-10–producing cells, but effects were still decreased in the absence of Etv5, compared with control cells. These data further support an important role for Etv5 in the appropriate function of GATA3 and E4BP4 in Il10 regulation. Etv5 deficiency decreases the ectopic expression effects of IL-10–inducing transcription factors. (A–C) Wild-type and Etv5-deficient naive CD4+ T cells were cultured under Th2 cell condition for 5 d. After 1 d of culture, cells were transduced with control or transcription factor–expressing retrovirus. On day 5, cells were stimulated with PMA/ionomycin for 6 h to assess IL-10 production using intracellular staining analysis. (A) Average percentage of IL-10–producing cells of GFP+ or human CD4+ (transduced) and (B) representative flow cytometry dot plots of data in (A). Data are means ± SEM of two independent experiments (n = 4 per experiment). *p < 0.05. Our data suggests that IL-10–inducing transcription factors require Etv5 for optimal binding and IL-10 induction (Figs. 4, 5). To test whether reintroduction of Etv5 rescues binding of other transcription factors to the Il10 locus, we introduced Etv5 into Etv5-deficient Th2 cells using retroviral transduction followed by a ChIP assay. Etv5-deficient Th2 cells infected by the empty virus showed decreased binding of IRF4, GATA3, and E4BP4 at the CNS3 region, compared with wild-type Th2 cells infected by the same virus (Fig. 6), consistent with data in Fig. 4C using nontransduced cells. Importantly, ectopic Etv5 expression in Etv5-deficient Th2 cells restored binding of all three transcription factors at the CNS3 region, indicating that Etv5 plays a pivotal role in regulating the binding of transcription factors to the Il10 locus. Ectopically introduced Etv5 in Etv5-deficient Th2 cells increases transcription factor binding to the Il10 locus. After 1 d of culture, Etv5-deficient Th2 cells were transduced with control or Etv5-expressing retrovirus. On day 5 of culture, ChIP assay was performed to examine transcription factor binding at the Il10 locus. Data are means ± SEM of two independent experiments (n = 4 per experiment). *p < 0.05, **p < 0.005. IL-10 is a critical regulatory cytokine. In the absence of IL-10, mice develop spontaneous autoimmune inflammation (23). Thus, transcriptional control of the Il10 gene is essential in maintaining disease-free immune homeostasis (7). In this study, we identify Etv5 as a regulator of IL-10 in Th1 and Th2 cells, in vivo and in vitro. Etv5 binds directly to the Il10 locus and facilitates the binding of a number of other transcription factors that regulate IL-10 production. The regulation of IL-10 production may be distinct among subsets of Th cells. Previous reports identified several transcription factors that are involved in Il10 regulation in Th2 cells. GATA3 remodels the Il10 locus independently of IL-4 production in Th2 cells (5). JunB and c-Jun proteins bind to the CNS3 region in the Il10 locus and induce IL-10 production in Th2 cells (10). In Th2 cells, IRF4 directly binds the Il10 locus and promotes IL-10 production (8). E4BP4 is reported as a universal IL-10 regulator in all Th cell subsets, and E4BP4 deficiency cause impairment of IL-10 production, but does not affect IL-13 production in Th2 cells (9). In this study, we add Etv5 to the list of factors that promote IL-10 production, and show that it works in concert with other factors by facilitating their binding to the Il10 locus. It is not clear whether Etv5 functions by directly interacting with other transcription factors bound to the locus, or whether it remodels chromatin, allowing other transcription factors to bind more efficiently. Nevertheless, Etv5 is required for the other factors to optimally induce IL-10 production. Etv5 adds to a subset of ETS family transcription factors that regulate Il10. Ets-1 represses IL-10 expression in Th1 cells by recruiting histone deacetyltransferase to the Il10 promoter and intronic regions (21). Polymorphisms in the human Il10 gene increase binding of the ETS factor Elk1 (24). PU.1 also negatively regulates IL-10 in Th2 and Th9 cells (8, 25). At least some of the mechanism of PU.1 function in Th2 cells is by interfering with IRF4 binding to Il10 locus regulatory elements (8). As each of these factors seems to function through different mechanisms, and have different effects on IL-10, it seems unlikely that there would be competition among them. Etv5 does not work in a subset-specific manner, regulating IL-10 production in both Th1 and Th2 cells. Interestingly, IL-27 could induce IL-10 in both wild-type and Etv5-deficient T cells, suggesting that it functions in an Etv5-independent manner (data not shown). Etv5 did not dramatically affect the lineage identifying cytokines for these Th subsets. This is in contrast to Etv5 function in Th17 where it is required for optimal expression of the lineage-associated cytokines (16). We detected little IL-10 production from Th17, Th9, and regulatory T cells in our culture conditions (data not shown), making it impossible to determine whether Etv5 is contributing to Il10 expression in these subsets. Additionally, even though we could detect IL-10–producing Th1 cells in our Th1 cell conditions, the number of these cells was quite low and not enough to study in more detail. This function might best be addressed in vivo in disease models where there are more IL-10–producing Th1, Th9, or Th17 cells. It is still not entirely clear how Etv5 acts at the Il10 locus. It is more likely that it functions by modifying chromatin, and opening the locus to allow other factors to bind, rather than physically interacting with each of the factors examined. However, this remains to be formally tested. Relevant to this point, transduction of Etv5-deficient Th2 cells with GATA3 or E4BP4 was able to increase IL-10 production. There could be several reasons for this, but it is likely that Etv5 is acting to increase efficiency of binding of the other factors, and that they do have partial function in the absence of Etv5. This is supported by the fact that IL-10 production and binding of some transcription factors is only partially diminished in the absence of Etv5. When cells are transduced and transcription factors are ectopically expressed, it shifts the equilibrium further toward binding by increasing the concentration of transcription factor within the cell. Importantly, even though GATA3 and E4BP4 can increase IL-10 in the absence of Etv5, production is not increased to the percentage of cells observed when wild-type cells are transduced. Thus, although increasing transcription factor concentration can increase IL-10 production, the effects of Etv5 deficiency are still observed. Mice that have Etv5-deficient T cells clearly do not behave as IL-10–deficient mice. The Etv5fl/fl CD4 Cre+ mice do not develop spontaneous autoimmune inflammation. Moreover, A. fumigatus–challenged Il10−/− mice showed exaggerated airway inflammation and excessive Th2 cytokines in BAL (22). In our studies, A. fumigatus extract–challenged Etv5fl/fl CD4 Cre+ mice demonstrated no difference in the overall inflammation, but they had a reduced number of IL-10–producing T cells in the BAL and lung. This is consistent with the partial role for Etv5 in IL-10 production that we observe in vitro and in vivo. The ∼50% decrease in IL-10 production is not sufficient to result in the more dramatic effects of IL-10 deficiency in vivo. Additionally, in non–T cells, where Etv5 is not deleted, IL-10 production is likely normal, further attenuating the effects of the T cell–specific deficiency of Etv5 in vivo. Our studies identify Etv5 as a promoter of IL-10 regulation in Th subsets. It binds the Il10 CNS3 element and facilitates the binding of several other IL-10–inducing factors that together control IL-10 production. This latest component of the Il10 enhancer complex provides new insight into regulation of immunoregulatory cytokine production in Th subsets and could provide another potential target for modulating IL-10 production in vivo. This work was supported by National Institutes of Health/National Institute of Allergy and Infectious Diseases (NIH/NIAID) Grants AI045515 and AI057459 (to M.H.K.). M.M.H. was supported by NIH/NIAID Grant T32 AI060519. Support provided by the Herman B Wells Center was in part from the Riley Children’s Foundation.
. 2013. Control of inflammation by integration of environmental cues by regulatory T cells. J. Clin. Invest. 123: 939–944.
. 1997. The transcription factor GATA-3 is necessary and sufficient for Th2 cytokine gene expression in CD4 T cells. Cell 89: 587–596.
. 2004. Conditional deletion of Gata3 shows its essential function in TH1-TH2 responses. Nat. Immunol. 5: 1157–1165.
. 2006. GATA-3 directly remodels the IL-10 locus independently of IL-4 in CD4+ T cells. J. Immunol. 176: 3470–3479.
. 2003. The complex role of interleukin-10 in autoimmunity. J. Autoimmun. 20: 281–285.
. 2009. IFN regulatory factor 4 regulates the expression of a subset of Th2 cytokines. J. Immunol. 183: 1598–1606.
. 2011. The transcription factor E4BP4 regulates the production of IL-10 and IL-13 in CD4+ T cells. Nat. Immunol. 12: 450–459.
. 2005. Regulation of IL-10 gene expression in Th2 cells by Jun proteins. J. Immunol. 174: 2098–2105.
. 2012. ETV1, 4 and 5: an oncogenic subfamily of ETS transcription factors. Biochim. Biophys. Acta 1826: 1–12.
. 2009. FGF-regulated Etv genes are essential for repressing Shh expression in mouse limb buds. Dev. Cell 16: 607–613.
. 2010. Preaxial polydactyly: interactions among ETV, TWIST1 and HAND2 control anterior-posterior patterning of the limb. Development 137: 3417–3426.
. 2011. Spermatogonial stem cell self-renewal requires ETV5-mediated downstream activation of Brachyury in mice. Biol. Reprod. 85: 1114–1123.
. 1999. The Ets transcription factor ERM is Th1-specific and induced by IL-12 through a Stat4-dependent pathway. Proc. Natl. Acad. Sci. USA 96: 3888–3893.
. 2014. The transcription factor Etv5 controls TH17 cell development and allergic airway inflammation. J. Allergy Clin. Immunol. 134: 204–214.
. 2016. The ETS family transcription factors Etv5 and PU.1 function in parallel to promote Th9 cell development. J. Immunol. 197: 2465–2472.
. 2014. Role of Blimp-1 in programing Th effector cells into IL-10 producers. J. Exp. Med. 211: 1807–1819.
. 2007. Stat4 limits DNA methyltransferase recruitment and DNA methylation of the IL-18Rα gene during Th1 differentiation. EMBO J. 26: 2052–2060.
. 2012. Interaction of Ets-1 with HDAC1 represses IL-10 expression in Th1 cells. J. Immunol. 188: 2244–2253.
. 1997. Interleukin-10 is a natural suppressor of cytokine production and inflammation in a murine model of allergic bronchopulmonary aspergillosis. J. Exp. Med. 185: 1089–1099.
. 2013. Preferential binding to Elk-1 by SLE-associated IL10 risk allele upregulates IL10 expression. PLoS Genet. 9: e1003870.
. 2005. PU.1 expression delineates heterogeneity in primary Th2 cells. Immunity 22: 693–703.